Paul Felder Defeats James Vick Via Unanimous Decision, Excellent Fight! UFC is making its official ESPN card debut tonight (Sunday, February 17, 2019), from inside Talking Stick Resort & Casino in Phoenix, Arizona. The co-main event of the evening brings the 155-pound match between James “The Texecutioner” Vick and the former CCFC Lightweight champion Paul “The Irish Dragon” Felder. Here we go! The match starts, and a tremendous left hand from Paul Felder lands. Vick delivers a body kick but eats a big overhand, what a fight! Body kick Vick, who connects a straight right. Felder attacks again, and now Vick goes for a side kick. Wow, spinning elbow from Felder, the fight gets better and better. Fighters continue to trade low kicks. Vick missed with a low kick, but lands a big right hand! This is war! Felder continues his low kick game and tries to punch his rival to the head, but no success. Vick delivers a knee, but Felder presses him against the cage. Vick lands a body kick. Felder spins again and it looks like Vick is rocked!!! James saves himself with a clinch! The end of the round, I’d say 10-9 Felder. Paul Felder throws a spin kick again. Vick evades, and now Felder forces a takedown, he nearly got his head caught by James Vick! Yet, he slips out, looking for the trip against the cage. Fighters are fighting for the underhooks, trying to deliver knees to the mid-section. Felder is able to reverse and the two split up. Felder goes forward but eats a big punch. Paul Felder continues raining kicks to the opponent’s legs. Now Vick lands straight punches, it looks like Felder is having a hard time here. Felder tries a spinning back elbow, while Vick responds with a spinning back kick, we’re looking a very attractive fight here. The war is on! Vick scores with low kicks too, these fighters are throwing everything they have. Vick evades another big right from his opponent, great slip. Knee to the body Vick, right hand Felder. The end of the round, very tough for scoring, the fighters were even. “The Irish Dragon” delivers two leg kicks, and now a great spinning back kick to the chest, wow! More low kicks from Felder, this turns into a real brawl! Felder connects more strikes, and it seems “The Texecutioner” is limping! Good knee to the body by Vick. Leg kick Felder. Great combination Paul Felder. Vick misses with two rights, Felder punishes him with a kick. Counter left Felder and Vick is stunned!!! 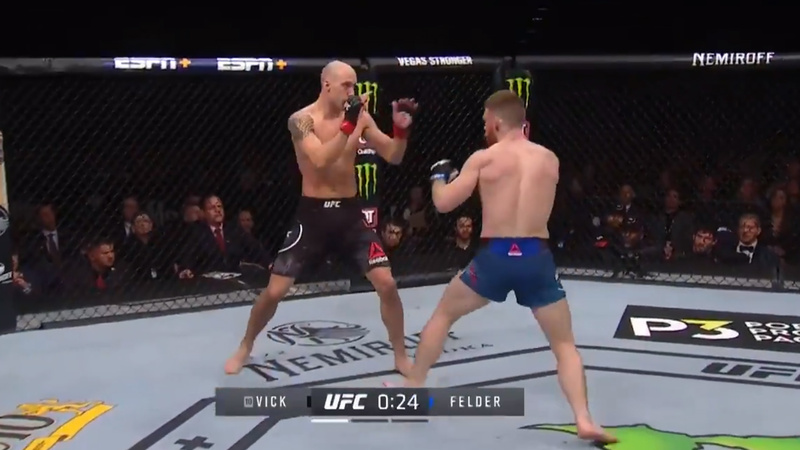 Switch kick to the body Felder, but Vick lands a right hook. Wait, he is not backing down, this guy is made of iron! Vick pushes Felder against the fence. Felder lands a winging right and a spinning elbow but Vick continues to go forward. Body kick Vick, and fighters continue to land shots from the clinch. Jumping knee from Vick to end the fight. Wow, this was a real war, I’d say 10-9 Felder. Paul Felder improves the score to (16-4 MMA, 8-4 UFC), James Vick drops to (13-3 MMA, 9-3 UFC).